I can't really pretend I know Portuguese. Though I can pretend that I really enjoy a huge portion of the Brazilian music I encounter. Granted this is almost all regulated to the Tropicalia sound in the 60s and 70s, my catalogs of Veloso and Buarque also show me some brilliant more traditional vocal pop. 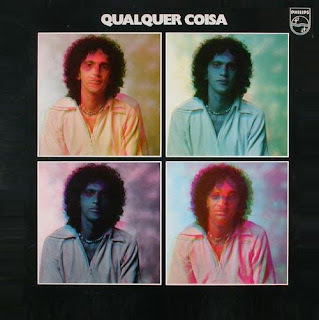 Qualquer Coisa was released simultaneously with Joia, which is probably my favorite Veloso album (yes, even more than the self-titles). It's release comes a little before Veloso was to move to the mainstream pop star he became in Brazil in the 80s, and thus the sound is still rooted in a little bit of that tropicalia sound, but veers more towards really nice lite vocal stuff. He covers 3 Beatles classics towards the end of the album, and though most people pan this choice, preferring his Portuguese languaged songs more, I cannot say that these are bad cover versions. A very nice, relaxing, beautiful album from a master.